Few people talk about dark granite countertops in Tampa Bay. But the truth is dark granite countertops are making a comeback into our kitchens. They are unique types of granite that can be a great investment for the improvement of your home. They have a unique way of improving the appearance of your kitchen. They are captivating and help create a more modern design style. All that is contributing to the increasing growth in the popularity of granite countertops that are dark in color. In this blog, you will discover the reasons why dark granite countertops are making a comeback to our kitchens. Keep reading to find out why dark granite countertops are growing in popularity. Do People Really Like Dark Granite Countertops? Dark granite countertops are very popular and trendy right now. This shows you that people like them. Dark granite countertops offer a captivating look, and they provide powerful performance. This is because dark colors are usually the hardest and more non-porous granite, which means less sealer required and less likely to get stains. Dark granite like any other granite, are strong and durable. They also make a powerful statement in your home. Choosing granite in dark colors is an excellent decision for your home improvement project. This would require you to understand your space and come up with a plan which is aligned to your specific, practical needs in the kitchen. Also, the style that you desire in your kitchen matters. Dark granite are perfect for classic, contemporary, and even modern designs. Investing in dark granite countertops is investing in a timeless style. The dark granite are beautiful and enhance an elegant, long-lasting look. You can change the kitchen’s paint and fixtures, but the countertops will always remain as the room’s mainstay. Dark counters can create an inviting atmosphere in your kitchen. This is especially so if you have a large amount of contrasting white cabinets. If you have lighter cabinets. Bright cabinets can complement dark countertops in a great manner. How to Design a Kitchen with Dark Granite Countertops? Dark granite countertops offer several ways of designing your kitchen. A majority of homeowners like contrasting dark granite with white cabinets or white island. Contrasting dark and white cabinets create a luxurious feel and instantly upgrades the room to high-end capacity. 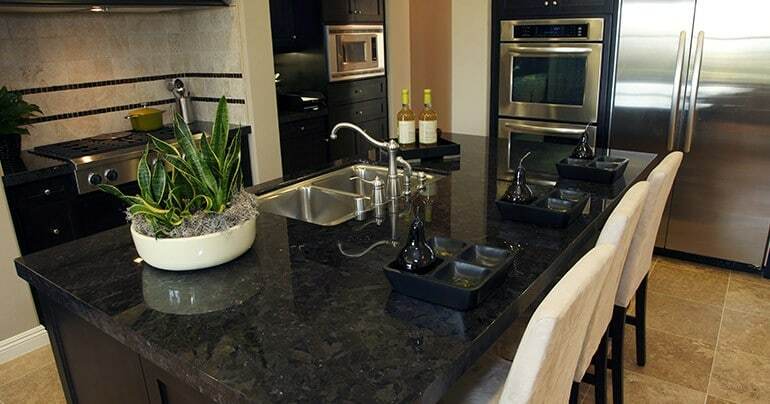 Dark granite countertops can also be used together with dark cabinets to create a luxurious and ultra-modern feel. Dark colors are not always boring; by contrasting with other materials or décor, they can be an excellent base in your design scheme. And a combination of dark counters and dark cabinets shows this is possible. Are all Granite Countertops That are Dark Black? Dark granite countertops are not all black, dark granite ranges from dark colors like green or blue to varying levels of black and greys. Patterns range from no pattern, low pattern, or crazy but beautiful veining and swirls of black and white. You have just found out why dark granite countertops are growing in popularity. They can upgrade the appearance of your space. They can offer a luxurious and inviting feel to the heart of your home. They have many different design applications but are mostly used to match with white cabinets for contrasting. Investing in dark granite cabinets is a worthy investment that is proving to be the desired look. If you want to see your different options with dark colored granite countertops. Then come down to our showroom and warehouse. 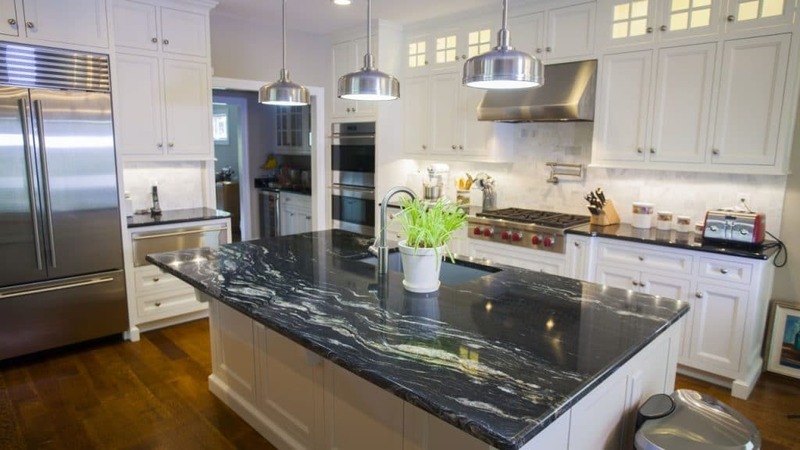 We carry dark granites and quartz materials and offer design consultation at no charge. This is truly the best way to shop for new countertops and we are always willing to help. Get granite countertops in Largo and the Tampa Bay area at Tampa Bay Marble & Granite.